There were high expectations for this Titanic miniseries. Julian Fellowes, well known actor, novelist, and film director was writing the script. It promised a fresh look at Titanic and was co-produced by Canada, Hungary, and UK production companies. Released in time for the 100th anniversary of Titanic’s sinking, it was seen by a world-wide audience on various broadcast networks. The miniseries has an astonishing 89 main characters, unheard of in most serials of this kind. Despite the wealth of source material to draw upon, the serial is part Upstairs, Downstairs tossed in with bits and pieces of action adventure. Oh and a strange love connection that makes no sense anywhere except in a television serial. What this reminded me of was Winds of War, the ABC miniseries drawn from Herman Wouk’s book of the same name. Wouk’s book was historical fiction using real history as a backdrop. The fictional Henry family moved through the history at different levels (high and low). Real historical figures were mixed in with fictional ones. The result was a blending that one might forget is fictional. And Fellowes follows that formula by blending real historical characters with fictional ones. One character I thought that played well was Captain Edward J. Smith. Smith was known as a tough captain and did not tolerate officers or crew disobeying his orders. Smith’s depiction in A Night To Remember was of a captain barking out orders after the iceberg hit. This serial gets it right (and also a little wrong too). The serial implies he had to be summoned when in fact he came out right away. He summoned Thomas Andrews and they both went below to access the damage. That was when, as depicted correctly, he realized the impact of what was to happen. Nearly over 1500 people were going to be thrown to the sea as the lifeboats, if filled to capacity, would hold 1,178. That realization is perhaps why Smith went into shock later and never barked out orders. He had to be asked to lower lifeboats and other things. Other things seem out of place, such as Murdoch having reservations about increasing speed due to icebergs. Or the justification for sending out lifeboats half-full to prevent them from splitting (they were fully tested by Harland & Wolff). Ismay getting into a lifeboat as it is going down (which did not happen). We also have Catholic vs Protestants, Irish home rule, social revolutionaries like Lord Manton’s daughter Georgianna agitating for women’s rights, or violent revolutionaries like Peter Pubov (based upon the real figure Peter the Painter). More nauseating are some characters who just are rude, unpleasant, and would make you long to grab a lifeboat and row away (Muriel Batley, Lord Manton’s wife Louisa, Grace Rushton). More confusing was how the serial was presented. It jumped back and forth in time in each episode. Instead of showing the whole thing in one continuous stream, we switch back and forth to learn more about various characters or historical situations. I found this odd for a historical drama. Italians were probably incensed at how they were treated on Titanic. One scene has the waiters for the Italian restaurant locked up and left to die because they did not want them running around on deck (fiction). There are genuinely sad moments as well, like when Jim Maloney finds his daughter Theresa below but they are trapped by a locked gate. Or when Annie Desmond finds Paolo in the rescue lifeboat dead. In the end, Titanic was not the worst serial ever done but just not that good. Fellowes tried too hard to convey the social, political and other issues of that time. Nor was it all historically accurate in many places either (like the fictional debate over lifeboats). People who know Titanic history will shake their heads at the many historical inaccuracies conveyed. If you are going to do historical fiction, at least make the real historical characters do and say what they actually did. What to watch for: Good acting, decent sets. 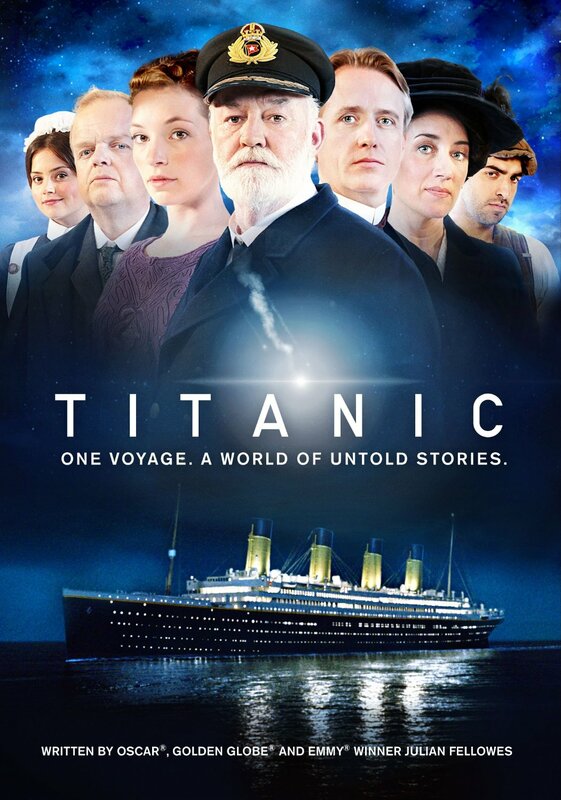 Titanic(2012) is available on dvd and streaming (Netflix).